(Nanowerk News) Iron is the most useful magnet in our daily life. It is a ‘ferromagnet’ at room temperature and ambient pressure, but displays a variety of other magnetic properties that depend on its crystallographic structure. Now, using a technique called angle-resolved photoemission spectroscopy (ARPES) on iron thin films, Jun Miyawaki from the RIKEN SPring-8 Center, Harima, and colleagues have uncovered the origins of a particular type of magnetic order ("Out-of-Plane Nesting Driven Spin Spiral in Ultrathin Fe/Cu(001) Films"), called the spin spiral (SS), which has eluded understanding despite extensive experimental and theoretical efforts. Magnetism in iron is associated with the spin, or quantum angular momentum, of the valence electrons of its atoms. In a ferromagnet the spins are parallel to each other; however, a structural change in the position of atoms in the crystal matrix of iron can order the spins into a spin spiral, such that the angle between the spins varies periodically (Fig. 1). Figure 1: Schematic representation of an iron thin film consisting of eight monolayers with a spin-spiral magnetic order (left). 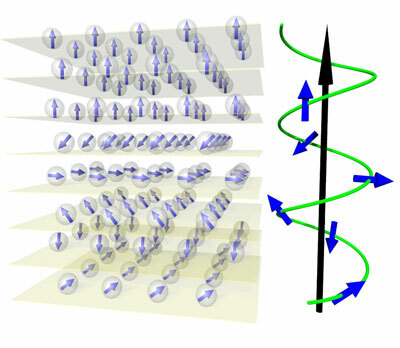 The angle between the spins associated with localized spins on the iron atoms varies periodically in a spin spiral (right). Miyawaki says he was shocked when he realized that the electronic structure of SS-ordered iron was still an open question; it is fundamental to understanding the material’s behavior. To elucidate the origin of this magneto-structural behavior, Miyawaki and colleagues studied ultrathin iron films consisting of eight monolayers with a ferromagnetic bilayer at the top and six SS-ordered monolayers below. The researchers used the ARPES technique to bombard the SS layers with soft x-ray photons and knock out electrons. Then they measured the intensities and angles of the emitted electrons. This yielded information about the electrons' energy and momenta from which they constructed Fermi surfaces to characterize and predict various properties of iron. Crucially, the researchers successfully mapped the energy-momentum relationship for electrons moving in- and out-of-plane of the iron film separately. Miyawaki notes that this required a concerted effort to develop the necessary instrumentation by his team at RIKEN and a team at the Japan Synchrotron Radiation Research Institute (JASRI). The experimental results showed stark differences with respect to the symmetries of the in-plane and out-of-plane Fermi surfaces. A detailed analysis revealed that the SS magnetic order is directly linked to electrons ‘inhabiting’ specific regions of the out-of-plane Fermi surface, thus providing direct information about its origin on a microscopic level. These findings not only provide vital clues to theoretical studies, but also suggest that iron thin films may be used in spintronics devices based on the spin-transfer torque phenomenon, Miyawaki notes. “Because right- and left-handed spin spirals exert a different spin-transfer torque on spin-polarized electrons, iron thin films could serve as memory devices,” he says.